We had a wonderful Fall Chubb Fellowship lecture and dinner with Gene Luen Yang. Please go to the Chubb website if you want to read more about the event. We’ll eventually post photos as well as a video from his Chubb address at the Yale University Art Gallery (YUAG) on the website. This week will be relatively quiet as we prepare for our week-long Thanksgiving break. Aside from our Senior Mellon Forum this Tuesday evening at 5:30pm, we will be taking a break from programs. 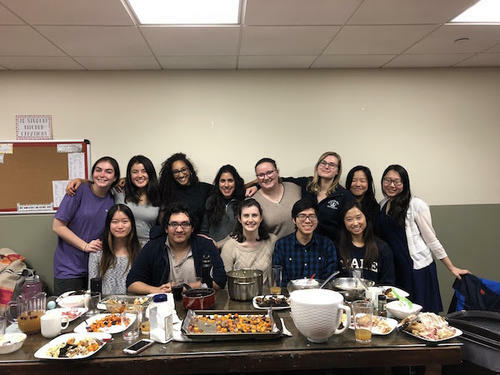 To get you all in a feasting mood, our “photo of the week” is from Nikita Raheja TD ‘20 and is titled “Friendsgiving”. Nikita captured this great moment of TDers sharing an early Thanksgiving dinner in the Student Kitchen. Speaking of sharing a meal with good friends, if you are staying on campus over the break, please know that the Balbarin/Lui family will be making Thanksgiving dinner in our house so come on over! Back by popular demand, we will be making gingerbread houses for the TD Common Room. Come on over for dinner and then break up into teams to create your gingerbread “masterpieces”! Our family has been doing Thanksgiving since I started as the Head of College of TD. We’ve fed many TDers – carnivores, vegetarians, and vegans – as well as friends from other colleges who are here for the week. So don’t be shy. There is also usually plenty of food to pack up after the feast! We’ll also make the Student Kitchen accessible to TDers who stay over the break. Students may come to the Head of College office on Monday 11/19 between 8:30am-4pm to sign out and borrow the kitchen key. Students who would like access to the kitchen at other times will need to contact one of our TD Aides, Thomas Zhang and Sarah Jho, who will be here over the break. We will put up their contact information on the door of the student kitchen. Please note that the Head of College office and the Dean’s office will be closed from Tuesdayto Sunday, 11/20-11/25. We will re-open on Monday 11/26. If you’re leaving campus for the week, please make sure to return all cups, bowls, plates, cutlery, etc. to the TD Dining Hall. We are starting to run low on mugs and bowls so please make every effort to return them! November 16, Friday: November recess begins, 5:30p.m. November 26, Monday: Classes resume. Find your path as a 2019 Liman Summer Fellow through the Arthur Liman Center for Public Interest Law. Yale Law students and undergraduates will speak about their experiences as Liman Fellows, the impact of their work, and how you can apply. Dessert and beverages will be served. Applications are due Tuesday, January 22, 2019. For more information on the fellowship and application requirements, see http://www.law.yale.edu/intellectuallife/undergraduatesummerfellowship.htm. Need to create a plan for the second half of the semester? Want advice on approaches to studying for a particular course? Sign up for a meeting with a peer Academic Strategies Mentor by clicking here, or contact academicstrategies@yale.edu. This initiative is a part of the Woodbridge Fellowship, in collaboration with the Yale College Dean’s Office and the Center for Teaching and Learning. Need a place to buckle down and get your work done? Come to CTL 121 for a relaxed but focused atmosphere, the support of FGLI student ambassadors, and sustaining snacks. See https://ctl.yale.edu/tutoring/undergraduate-writing-tutoring for more detailed information. Many introductory courses have course-based peer tutors—consult your syllabus or look up your course to see if they are available. Don’t have a course-based peer tutor? Residential College Science and QR tutors are available for drop-in appointments throughout the week. Students who have tried Course-Based Peer Tutors and visited the Residential College Math/Science tutors, but still need more help, can request scheduled tutoring in small groups or one-on-one. Have paper due at the end of term? Now is the time to contact your Personal Librarian to discuss your research. Remember, the sooner you start your research, the more time you’ll have to write a fantastic paper.